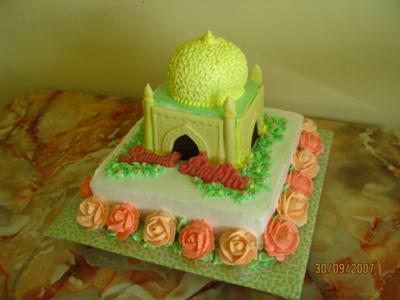 I made this Mosque cake yesterday for a friend celebrating Hari Raya. It consist of a 10" and a 6" square strawberry cheesecake, and a 4" square cake that I trim to a ball for the top of the mosque. To make the wall of the 3D mosque, I used melted white chocolate tinted with yellow and molded 4 sides of the wall and pillars 1 day before icing the cake. Then I piped medium size roses using 2 colors to create a contrast effect.